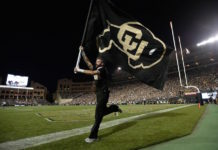 The Colorado Buffaloes kicked off the 2016 college football season in style, pouncing on the Colorado State Rams 44-7 in the 87th annual Rocky Mountain Showdown at Sports Authority Field. Buffs quarterback Sefo Liufau looked great in his first game back after he suffered a foot injury against USC last season, going 23/33 for 318 yards and one touchdown. He displaced any doubts that his foot injury would linger by rushing for 66 yards on 14 carries and taking a couple of big hits. The senior also set the mark for most passing yards in school history by passing former quarterback Cody Hawkins, who held the record with 7,409. Liufau sounded confident but wasn’t so quick to discredit the Buffs’ mistakes, as they had two turnovers and were bailed out by center Alex Kelly after Liufau fumbled the ball at the one yard line in the first quarter. Kelly landed on top of the ball in the end zone making him the first offensive lineman to score a touchdown for the Buffs since 1995. Through the first quarter, the Buffs had 12 total first downs while holding their opponent to zero. In fact, the Rams didn’t garner a first down until 10:30 left in the second quarter. 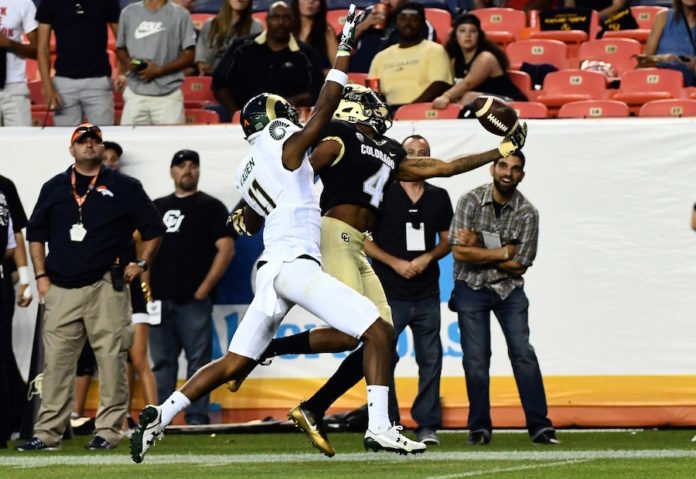 But the story of the game was the wide receivers, Bryce Bobo (5 REC, 99 yds) and Devin Ross (8 REC, 97 yds, 1TD). Ross, in his sophomore season, had 25 receptions for 324 yards and two TDs. After last night’s game, he is already on pace to triple his statistics in every category. Ross made a bunch of big catches, including an incredible 31 yard catch falling out of bounds and a 17 yard touchdown catch with his buddy Bryce Bobo making the critical block. Ross seemed happy but told the media he was disappointed in his drops. He burned his defender a number of times and so did his teammate. Bobo had 24 receptions for 207 yards during his sophomore campaign and has almost reached half those numbers in one game. Bobo made an unbelievable one handed grab in the second quarter after the Rams were flagged for an offsides and Liufau threw a deep pass to Bobo on a “free” play. Running back Phillip Lindsay finished the drive with a one yard TD run, his second of the game. Lindsay finished with 95 yards on 20 carries and two TDs. Lindsay gave a lot of credit to his offensive line. Lindsay also had some fumble troubles losing the ball once and having his second fumble overturned after replay showed he was down. “I’m not much of a fumbler, but I guess I’m just going to have to walk around school with a football in my hand,” Lindsay jokingly told reporters. Shay Fields, the Buffs No. 1 receiver, added a 60 yard reception and was called down at the one yard line in the first quarter. Lindsay also finished that drive with a one yard TD run. The three fumbles were about the only thing the Buffs did wrong as their hurry up offense was too overwhelming for Rams, especially in the first half. Lindsay had 66 yards on 11 carries after the first quarter and Liufau had six carries for 37 yards. The team had over 100 yards rushing, in total, after the first quarter. Coach Mike Macintyre looked and sounded confident after the blowout win. “It was fun to see us run the football the way we did,” Macintyre said. Macintyre, like the rest of his players, wasn’t going to overlook the Buffs mistakes though and didn’t have the feel of a coach that was completely satisfied. When asked if this was his best team, Macintyre wasn’t shy to admit it. “This is the best football team we’ve had since I’ve been here and there extremely focused,” Macintyre said. 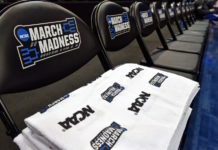 The Buffaloes couldn’t have made a bigger statement against their in state rival, but the feeling you got from this team after the game is that this experienced roster wasn’t going to look past their mistakes and they’re confident, even after a 37 point win, that they can play better, much better. The Buffaloes host the Idaho State Bengals in their home opener at Folsom Field next Saturday at 3:30PM.